The Yellow-shouldered Parrot or Yellow-shouldered Amazon (Amazona barbadensis barbadensis) is endemic to northern Venezuela, the Venezuelan islands of Margarita and La Blanquilla, and the island of Bonaire (Netherlands Antilles). 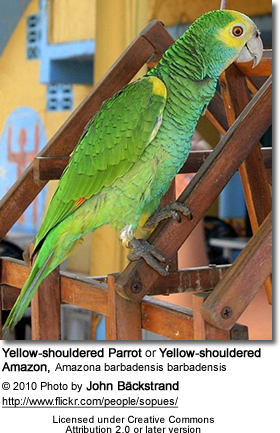 This parrot has become extinct on Aruba and possibly also on Curaçao (Netherlands Antilles). Outside the breeding seasons, they are highly gregarious when not breeding, forming flocks of up to 100 birds. 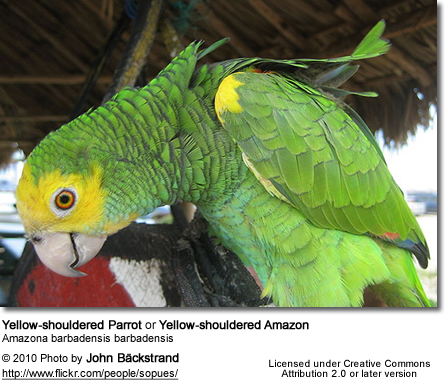 The Yellow-shouldered Amazon averages 31 - 33 cm (~12.4 inches) in length (from head to tip of the tail). Its plumage is mostly green, with yellow patches on the head, shoulders, around the eyes, and often over the ear openings and chin. The thighs and the bend of the wing (also known as "shoulders") are also yellow, but both can be difficult to see. It has bare, white eye-rings and a red patch on the wings. The throat, cheeks and belly often have a bluish tinge. It has broad dark blue tips to the flight feathers and a red wing-speculum. Its beak is horn colored. 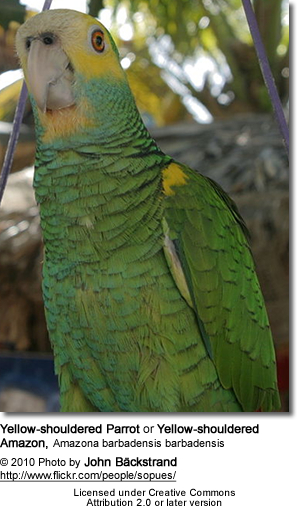 Within its range, the yellow shoulder patch and extensive yellow on the head distinguish the Yellow-shouldered Amazon from other Amazon Parrot species, which have red or orange on the shoulder and less yellow on the head (the Orange-winged Amazon, which has as much yellow to the head as some Yellow-shouldered Amazons, has a blue eye region). 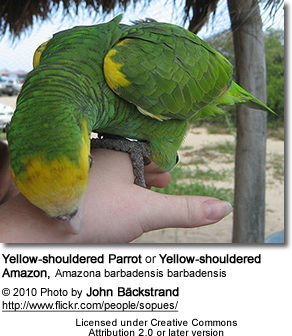 However, outside its range, several other Amazon Parrot species have as much or even more yellow on their heads. Its primary diet consists of fruits, seeds and cactus flowers. Yellow-Shouldered Amazons are rare Amazons with engaging personalities. They are inquisitive and curious to the point of being "nosy" and their gentle nature only adds to their charm. Always playful, Yellow Shoulders are active Amazons that require a cage stocked with toys. They can be quite the acrobats so swings and hanging toys are also a must. Yellow Shoulders can become accomplished talkers and are usually very outgoing. Our breeding pairs of Yellow Shoulders always have words for us as we service their flight.